Every day my email box and social media streams are filled with “exciting” news of promising RA breakthroughs and so-called cures. But rarely is there news that I know will make a difference—either to investigators studying rheumatoid disease (RD) or to people living with RD (PRD). 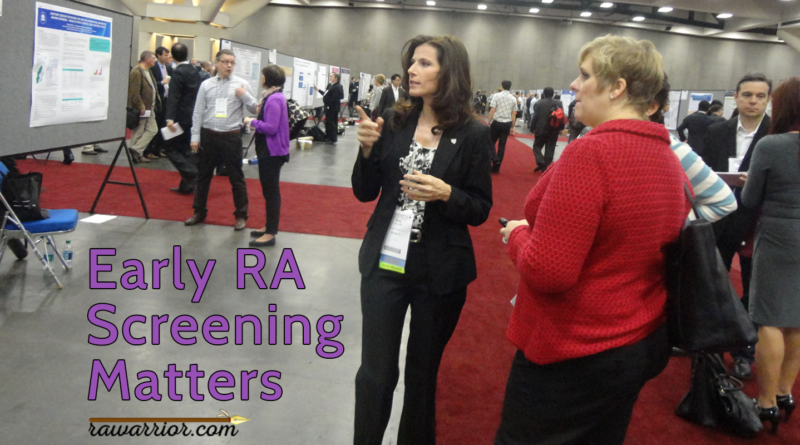 Today, with regard to early RA screening, we have both. First, last month I was excited (for real) to read newly published results of the PRAIRI study, Effects of B-cell directed therapy on the preclinical stage of rheumatoid arthritis.1 Dutch investigators administered a singe dose of rituximab to 81 people at high risk for developing RD. They saw a 12-month delay in onset of joint symptoms, compared with those who did not receive rituximab. Of course, rituximab is usually given in multiple doses, making this finding even more remarkable. 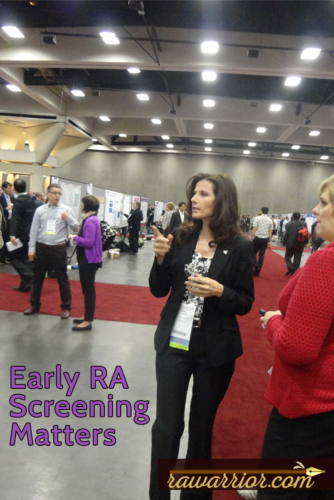 Early RA screening for pre-clinical RA is not a new idea. In fact this report might not surprise you if you’ve read my book—I’ve closely followed research on so-called “pre-clinical” RA and fiercely advocated treating very early rheumatoid disease. Several investigations have suggested that it’s possible to delay or prevent onset of full-blown rheumatoid disease. As I’ve said many times, this IS OUR CURE—at least for now. Second is the launch of a first-time ever at-home early RA screening test. 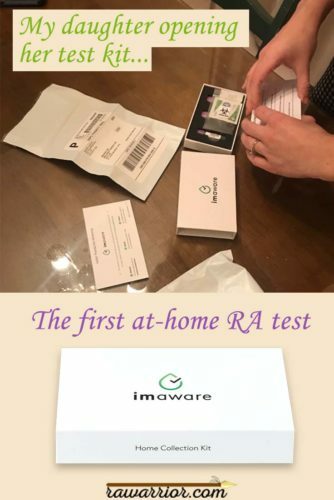 The at-home test from imaware™ is done in five minutes with a few drops from a single finger prick. It is reviewed by a doctor and includes information you share about symptoms and family history. 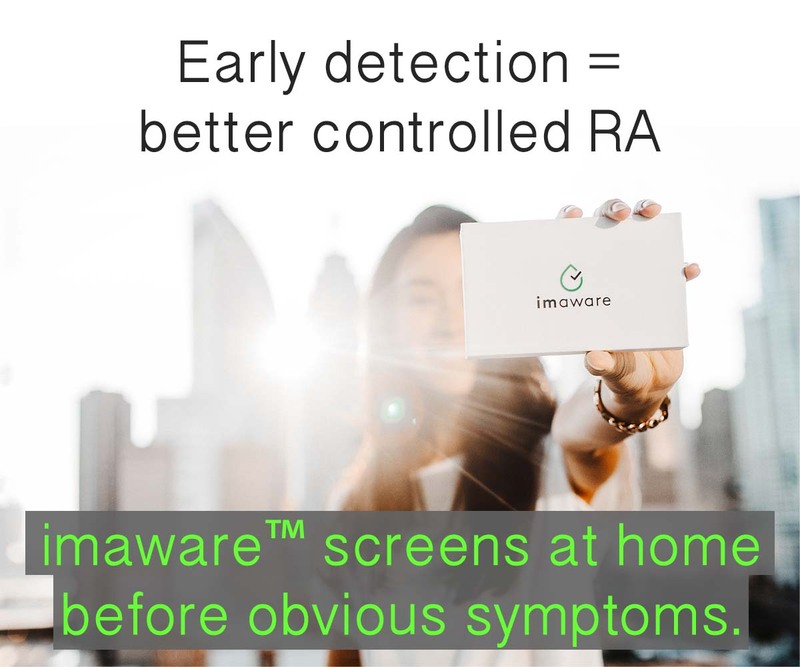 imaware™ actually tests three antibodies highly predictive of rheumatoid disease: one type of anti-CCP / ACPA and two rheumatoid factors. I’ve written quite a lot about RA tests over the years so you may recall that RF’s tend toward positivity over time with the disease, but ACPA’s tend to be positive earlier—even before symptoms are persistent. The PRAIRI study reports that both antibodies “can be found in the peripheral blood of individuals >10 years before the development of autoantibody positive rheumatoid arthritis.” I have some read reports of antibodies being present up to 20 years before diagnosis, but of course 10 years is incredible. Take a moment: that’s a possible 10-year warning for a disease with a six-week window of opportunity for successful treatment and the choice of either preventing full-blown disease or suffering progressive disease that doesn’t respond to current treatments (like me). Early RA screening puts us at the verge of major change of the disease model—change that I’ve advocated for a decade. That begins with recognizing “preclinical” disease—that RD does exist before finger swelling. Because I believe so strongly in helping people be diagnosed earlier, I am working alongside imaware™ as a patient liaison during the launch. I will ensure that what they do is patient-centered and benefits the #rheum community. They are giving patients a voice by working with me, which is another thing I’ve consistently advocated for over ten years (industry putting a patient on the team instead of stealing their content, etc.). Hi Kelly, so good to see you and hear from you. I have been a follower for many years. I want to comment on Rituxan (sp). 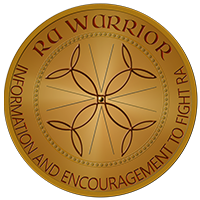 I was very lucky to find a Rheumatologist who believed in being aggressive to fight my RD. After going through the meds which insurance makes you go through I started getting Rituxan. It is an infusion every six months. I should add that my blood work was showing Lupus markers as well and beginning to effect my kidneys. I started about five years ago and today my Lupus is in remission and my inflammation numbers are way down. My nephrologist only wants to see me once a year. When I started my sed rate was up to 90 and now it is at 6. I feel like Rituxan has been a life saver for me. I still have flares and I deal with fatigue, but I can now have somewhat of a quality of life. 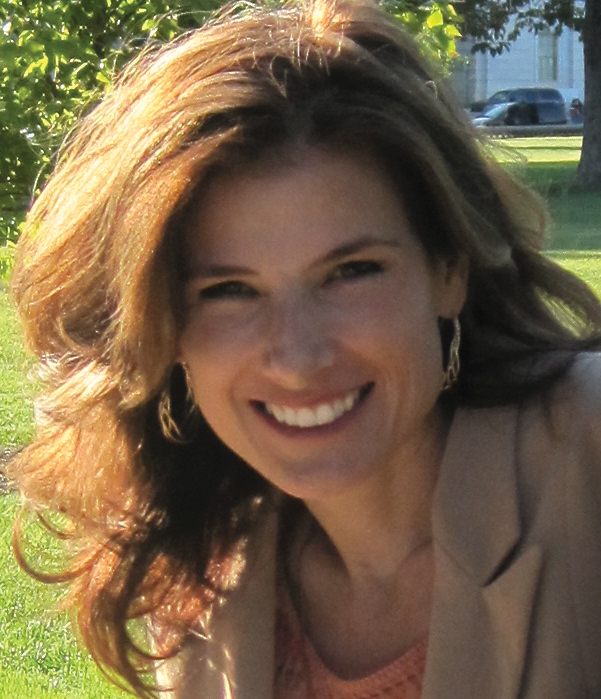 Hi Kelly I too have been following you for several years…since I believe 2006-2007. You have made me a fighter in trying to get answers! Answers that I cannot get, because I have no inflamation markers! Would this “imaware” at home test, find RD in RD Negative patients or patients with Palendromic RD??? Thank you for everything you do for us! It would be impossible to predict Rosy. This tests three different common antibodies in RD, but there are many. So they call you “seronegative” but you do have antibodies — just not the ones for a particular test, or enough to be detected. Also, over time, more of them tend to test positive. No doubt this is a wonderful advancement, to a point. We have to be careful that we do not sentence people to a life which might be uncertain or give reassurance that a prognosis will not occur when clinical evidence might demonstrate otherwise. Still it is a wonderful first flag to find that needle in a haystack. In the diabetes world we identify antibodies that might be related to type 1 as early as two years of age. The massive trial is called TrialNet (https://www.trialnet.org/). We are careful not to preordain people to diabetes but we also know that if the antibodies are there people have a far greater chance of having type 1 before 40. Interesting enough the current front line treatments include Plaqueni, Orencia and Amevive. Ahh the world of immunosupressants may cross.